Popeye: the large forearmed, one-eyed sailor who never met a craft he couldn’t pilot, or a fight he couldn’t win—especially with his trusty can of empowering spinach handy. While there aren’t many familiar with the tenacious sailor, would you believe he was never intended to be a star? Cartoonist Elzie Crisler Segar, best known as E.C. 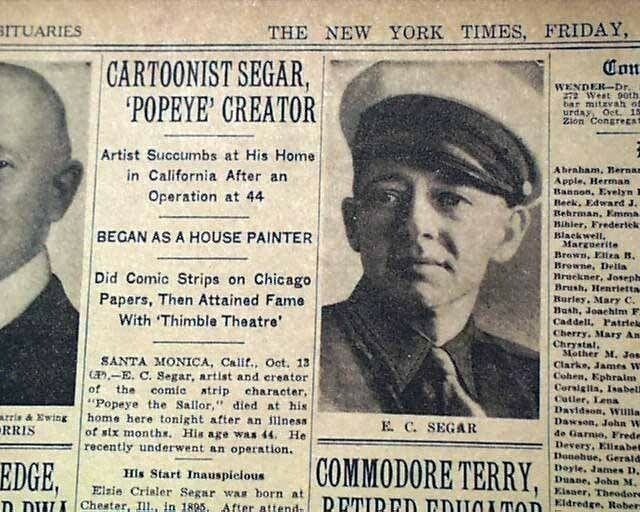 Segar, debuted the comic strip Thimble Theater for King Features Syndicate on December 19, 1919. The strip’s name alluded to the theatrical style in which its characters would act out various stories and scenarios. The strip starred the thin and lanky Olive Oyl and her boyfriend, Harold Hamgravy (also known as Ham Gravy). Eventually, the strip evolved from its original premise and focused on comedic adventures with Olive and Ham joined by Olive’s brother, Castor, and her parents, Cole and Nana. The strip wasn’t very popular, attracting a small audience and only appearing in half a dozen newspapers. 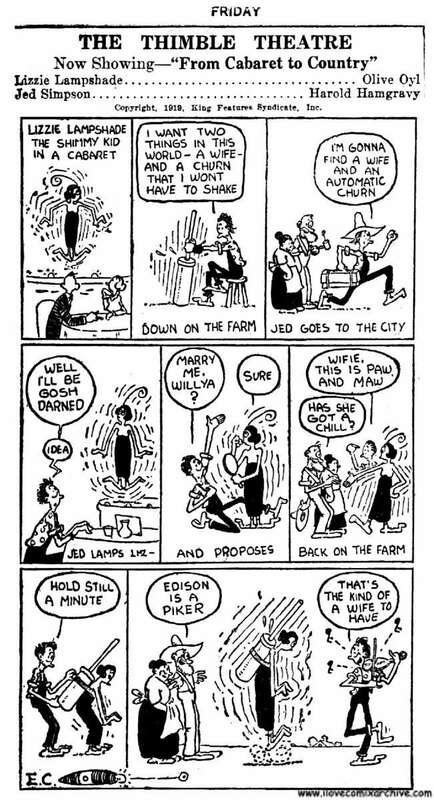 Things changed on January 17, 1929 when Popeye was introduced into the strip. He was hired by Castor and Ham to crew a ship on their latest adventure to break an island casino owned by a crooked gambler. Popeye was gone after that, but the readers became enamored with the sailor and he was quickly brought back. A collection of the comic strip. As Popeye’s popularity began to grow, so too did that of the strip as more newspapers began running it. Popeye became the star, earning top billing after the strip’s title (the strip would be renamed Popeye in the 1970s). Olive left Ham to become his girlfriend (although a fickle one at that as gags would routinely feature her becoming enamored with other suitors). Ham himself was reduced from a regular character to making occasional appearances. Castor remained, often enlisting Popeye in his get-rich-quick schemes before settling down as a detective and later as a ranch owner. Beginning in 1933, Segar began introducing a new supporting cast. Popeye received a foundling baby in the mail that he would adopt and name Swee’Pea; Popeye’s closest associate was J. Wellington Wimpy, a cowardly hamburger-loving moocher who would “gladly pay you Tuesday for a hamburger today”; George W. Geezil, a local cobbler who hated Wimpy with a passion; Eugene the Jeep, a yellow and spotted magical animal from Africa that crossed over from a fourth dimensional world; the Sea Hag, a witch and pirate who served as Popeye’s primary antagonist; Alice the Goon, an Amazonian giantess who originally served as the Sea Hag’s minion but was released from servitude by Popeye and became Swee’Pea’s babysitter; King Blozo, the ruler of Spinachovia where spinach grew in abundance; and Poopdeck Pappy, Popeye’s father who disappeared at sea shortly after Popeye’s birth, amongst others. Segar would also feature crossovers between Thimble and his other strip, Sappo, which featured crazy inventor O.G. Wotasnozzle and his long-suffering landlord John Sappo. Thimble Theater became one of King Features’ most popular strips, a poll by Fortune magazine indicating it as the second-favorite strip behind Little Orphan Annie. The strip was running in 500 newspapers and a lot of merchandise based on the character was being sold. Segar was earning upwards of $100,000 a year from his creation (over $1.7 billion dollars in today’s money). Unfortunately, Segar died from leukemia and liver disease in 1938. The strip continued under the stewardship of many different artists; notably Bud Sagendorf in 1959, who had been working on the Popeye comic book since 1948. Promo for Popeye and Betty Boop. In 1932, King Features entered into a partnership with Fleischer Studios to translate their Thimble Theater characters into a series of animated shorts. Released by Paramount Pictures, the series would become a staple of the studio for almost 25 years. Popeye made his debut in Popeye the Sailor, a 1933 Betty Boop cartoon. 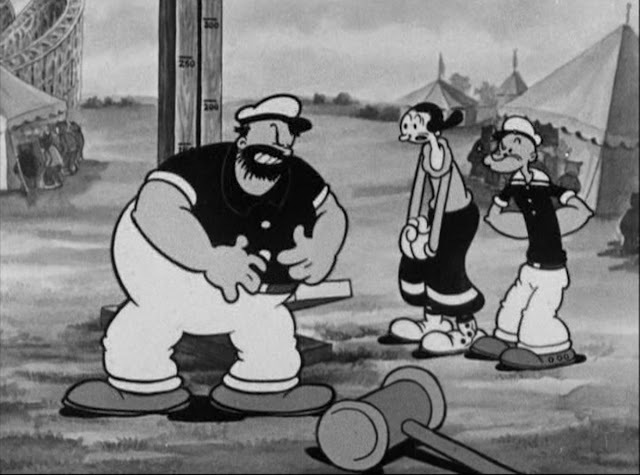 The short introduced the core concept of Popeye’s (William Costello) ongoing rivalry with burly fellow sailor Bluto (William Pennell) over the affections of Olive (Bonnie Poe), which would become a running theme in Popeye productions to come. Bluto was created by Segar as a one-time villain for the strip in 1932, but Fleischer decided he would be the perfect antagonist for their films. 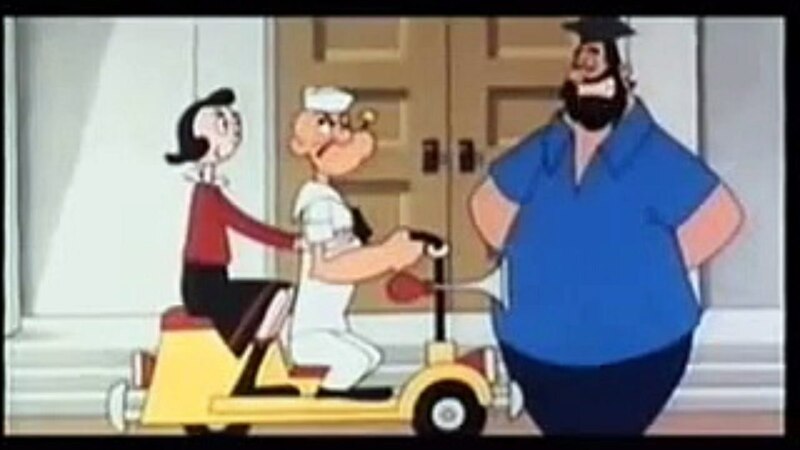 Bluto causing trouble for Popeye and Olive. Unable to replicate the deeper plots of the strip, Fleischer settled on an episodic format that saw Popeye ending up bested by his foe until he ate a can of spinach, giving him super strength and allowing him to emerge victorious. 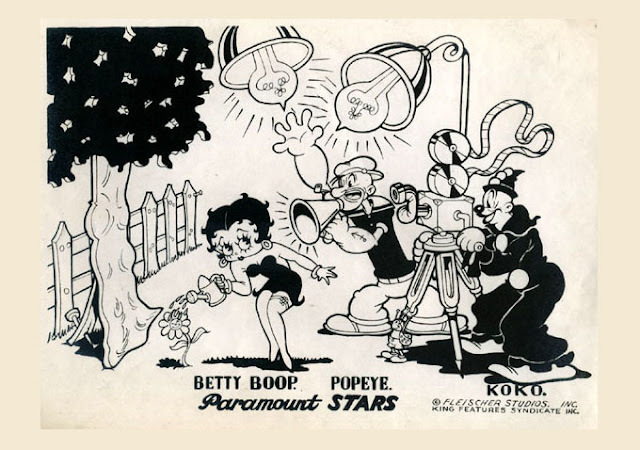 Jack Mercer would assume the Popeye role in 1935 (Harry Welch filled in when Mercer was serving in the Navy), with Betty Boop’s Mae Questel (who actually developed Olive’s voice, modeled after ZaSu Pitts) taking over as Olive in 1934 (and sometimes filling in for Popeye), and Jackson Beck becoming Bluto’s regular voice in 1942. Sammy Lerner composed the signature theme song that Popeye would usually sing about himself; making him one of the few cartoon characters at the time to have his own theme. Just a couple of sailor boys trying to woo a lady. In 1941, Paramount assumed control over the studio and renamed it Famous. 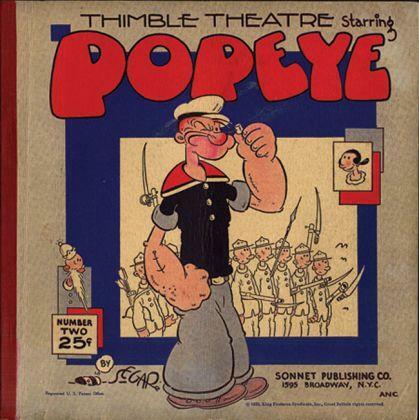 At the same time, growing concerns over World War II saw Popeye enlisted into the U.S. Navy; trading in his familiar sailor’s garb for an official white Navy uniform. In 1943, the series moved to color with a combination of Technicolor, Cinecolor and Polacolor productions. 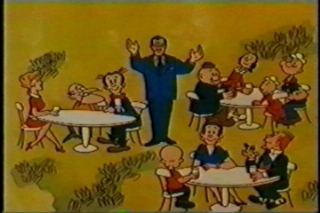 By the mid-1950s, increasing competition from television began moving studios away from theatrical shorts and Famous saw their budgets and staff cut, although they continued to produce the same number of cartoons a year. The studio was again renamed Paramount Cartoon Studios in 1956 and the series continued for one more year, ending with 1957’s Spooky Swabs. a.a.p. title card for the Popeye shorts. The initial agreement with King Features was that any films would be destroyed within 10 years (which would have obliterated all of the Fleischer shorts), but Paramount was forward thinking and held onto their best-selling and most popular series for future distribution; seeing television as a rising and viable outlet. 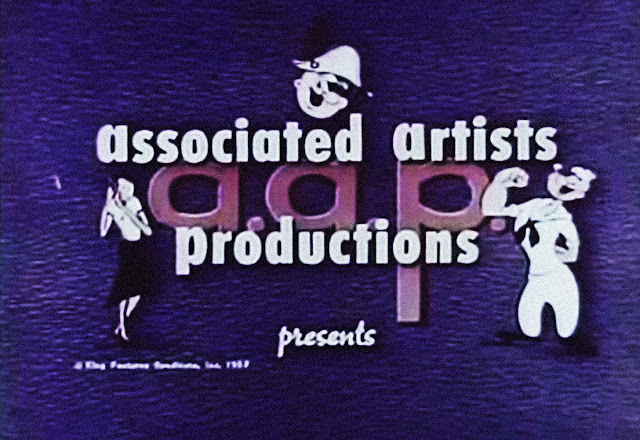 In 1956, Paramount sold the television rights to the black and white Popeye shorts to Associated Artists Productions (a.a.p. ), and the color rights a year later. a.a.p. created their own openings for the cartoons which used a version of the Popeye theme from 1948’s Olive Oyl For President, with the Paramount logos and “Paramount Presents” title cards removed by request. The shorts proved immensely popular during their television run. Popeye thinks Brutus is up to something. 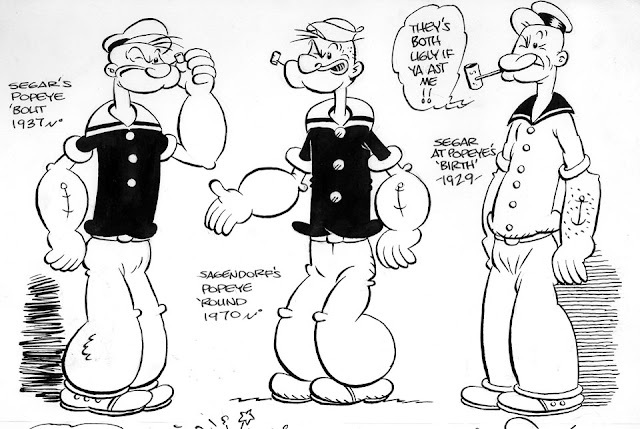 King Features, seeing the potential to reap greater rewards, not only began marketing Popeye-related merchandise, but looked to create all-new shorts that they would own outright (although, they used the excuse that audiences were growing bored with the older shorts). King Features commissioned the production of 220 new shorts within a 2-year timeframe. As one studio was unable to handle such a load, the work was farmed out to several studios: Jack Kinney Studios, Rembrandt Films, Larry Harmon Pictures, Halas and Batchelor, Southern Star Productions, TV Spots, Inc. and Paramount’s own studio. The result was a hodgepodge of quality in both the animation and the writing. The only consistency came in the voices by Mercer and Questel, who took time from her busy advertising and Broadway schedule to reassume the role. 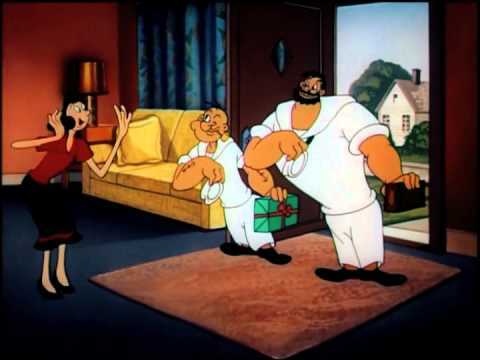 Beck also returned as the villain, but Bluto was reimagined as Brutus; who was the same character in everything but name. King Features mistakenly believed Paramount owned the rights to the character and thought it simpler to just change him than enter any legal battle. That belief similarly led them to utilize characters from the strips not seen in animation yet, like the Sea Hag (Questel). Popeye amongst a gathering of fellow comic strip pals.